Based on the trailers and movie posters, my only real expectations for Kong: Skull Island were lots of CGI and a half-baked, boring romance between Tom Hiddleston and Brie Larson. I'm happy to report that it looks like some of the more comedic elements of the script (or most likely, unscripted moments) appear to have hijacked the actual plot, leaving Hiddleston and Larson almost nothing to really do in the film itself, which is probably for the best. The first 20-odd minutes of Kong are spent with your typical "assemble the team" beats. Bill Randa (John Goodman) and Houston Brooks (Corey Hawkins) have convinced the government to fund an expedition to an uncharted island, where they hope to explore who-knows-what before the Russians discover it too. Set in the 70s, the expedition comes on the heels of the U.S. withdrawing from Vietnam, so a group of soldiers led by Preston Packward (Samuel L. Jackson) who are supposed to finally go home end up accompanying the scientists to offer safe passage. They recruit James Conrad (Tom Hiddleston) for his ability to "track people" (we literally never get more info on him than that) and Brie Larson tags along as a photojournalist searching for... I don't really know what. With a group of more than a dozen soldiers and scientists combined, the expedition heads to the island where, as we all know, they'll come face-to-face with Kong. After crashing, the group gets separated and wanders somewhat aimlessly in hopes of making a rendezvous point to get off the island, encountering giants versions of bugs and other creatures along the way. The banter between the soldiers is pretty well-written, and the action beats are basically so-so. The movie clearly wants you to think about Jurassic Park, but truth be told, I thought about Honey I Shrunk the Kids. The camera also awkwardly swirls around Larson and Hiddleston, like a clothing commercial, as they lead the way across the island, but their characters are boring and paper-thin. 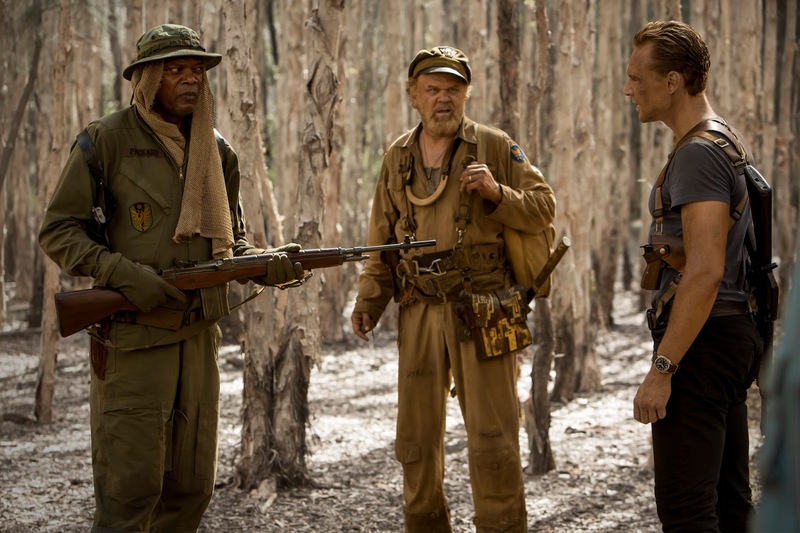 Some general hints at character development are dropped in the beginning, but as soon as the adventurers discover Hank Marlow (John C. Reilly), who has been living on the island for decades, the movie spins in a completely different direction. Reilly is clearly ad-libbing most of his dialogue, and the film abruptly shifts tone to something between a generic action/adventure film and something you'd see out of an Adam McKay flick. I obviously don't know what happens on these films behind the scenes, but Kong: Skull Island feels like a movie that had 30-40 minutes of its original, intended character arcs left on the cutting room floor in favor of the fresher and better humor and development carved into the movie by Reilly. Samuel L. Jackson also has some moments that feel like they took the same path, cutting off the generic action dialogue in favor of something more comedic. Truthfully, their characters are probably the only ones with anything resembling development, and it's most likely due to the work imbued by the actors themselves. I can't say Kong: Skull Island is a great movie, but it's a good deal better than the generic "war is hell" action movie it probably almost was. 2 parts bland action movie, 1 part McKay comedy, and 1 part Honey I Shrunk the Kids leaves you with a weird combination of scenes that, at the very least, warrants intrigue and curiosity.